Brazil, officially the Federative Republic of Brazil, is a country in South America. It is the fifth largest country by geographical area, occupying nearly half of South America, the fifth most populous country, and the fourth most populous democracy in the world. Bounded by the Atlantic Ocean on the east, Brazil has a coastline of over 7,491 kilometers. It is bordered on the north by Venezuela, Guyana, Suriname and the French overseas department of French Guiana; on the northwest by Colombia; on the west by Bolivia and Peru; on the southwest by Argentina and Paraguay and on the south by Uruguay. Ceara is one of the 26 states of Brazil, located in the northeastern part of the country, on the Atlantic coast. It is one of the main tourist destinations of Brazil. Ilha do Guajiru is going to host the PKRA in the next years. The best period to visit Prea is from July-December. Avarage price per night is something like R$100 (1euro = R$3,3). The climate is hot and humid on the coast, tempered by the cool trade winds; but in the more elevated, semi-arid regions it is very hot and dry (often above 35Â°C, but seldom above 40Â°C), although the nights are cool. However, in the higher ranges (Serra da Ibiapaba, Serra do Araripe and several less larger highlands) the temperatures are colder and vary from about 14Â°C to 34Â°C. The year is divided into a rainy and dry season, the rains beginning in January to March and lasting until June. The dry season, July to December, is sometimes broken by slight showers in September and October, but these are of very slight importance. This environment and temperature attracts many tourists, especially ecotourists. The climate is hot almost all year round. The temperature in the state varies from 22Â°C to 36Â°C with the lowest temperatures not being typical in the capital Fortaleza but in the numerous mountains in the state. The size of the sandy beach is tide depending. With high tide it gets very small but it is huge with low tide. Watch out for sharp shells. The huge main Lagoon with warm shallow water, measuring 4000x400 meters got superflat water and has the nickname: The Flatwatersea. This big lagoon is tide depending, with low tide you can kite on other places closeby. Because of the wind direction you are not kiting on the full lenght of the lagoon but on its width. The watertemperature is 29Â°C whole year, so you never need a wetsuit. The best months are August-Junuary, but from Februari-July there are still a lot of kiteable days per week. The wind always blows from the east. The wind is more stable on the ocean than on the lagoon. This spot is becoming very populair so all faclities you need are right there. There are a lot of other spots in the area. 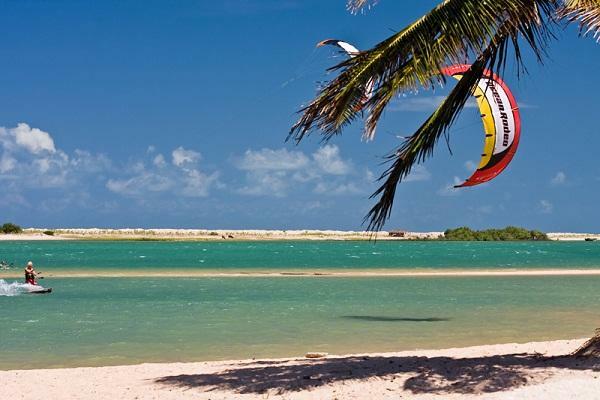 The sandy beaches are endless so you can kite everywhere. 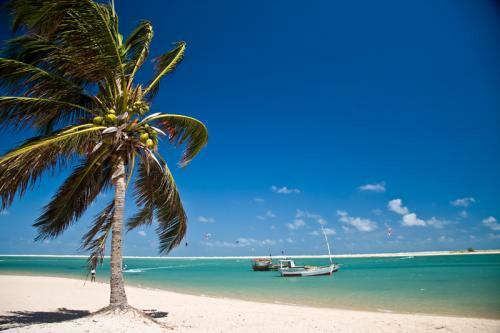 Famous spots that are a littlebit furhter away but also nice to visit are Jericoacoara and Prea. The nearest big city and aiprot is Fortaleza, wich is on a 3-4 hours drive. There is a new highroad so transport by car or bus is easy.